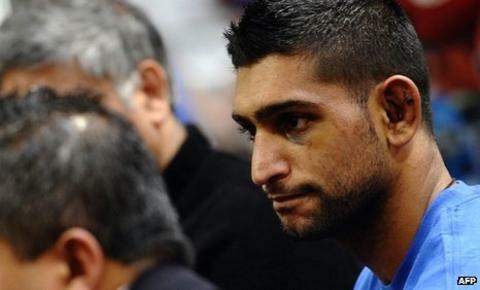 Amir Khan says he wants to fight Floyd Mayweather by the end of 2012 following a spring rematch with Lamont Peterson. Khan's comments come after the World Boxing Association ordered a rematch between Khan and Peterson, after the Briton claimed ringside wrongdoing. "I have a 10-week training camp so I envisage the Peterson [rematch] to be in April or May," Khan told Sky Sports. "But my ideal opponent is Floyd Mayweather. Hopefully I can fight him before the end of the year." Khan said he would never fight Manny Pacquiao, whom Khan trains with, but believes a fight with Mayweather is realistic. But the Bolton fighter remains focused on proving that his defeat by Peterson last month was illegitimate. The WBA has confirmed the rematch will take place within 180 days of the initial bout. "I want to get that rematch and beat him,'' Khan told BBC Sport. "I want a fair fight, somewhere neutral like Las Vegas or Los Angeles, with neutral judges and a neutral referee. "Credit to Peterson because he fought a good fight, but I will go out there a second time and knock him out convincingly," he added.